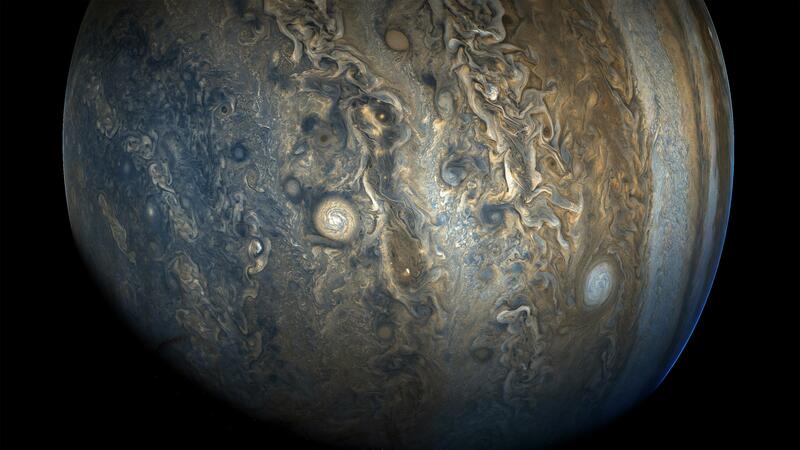 NASA’s Juno probe took its 9th set of drool-worthy images during it most recent close flyby of Jupiter on Oct. 24. The spacecraft travels in a highly elongated orbit around Jupiter once every 53 days. For just two hours during that time, it loops in close to the planet’s polar regions to grab data and new images. That closest point is called perijove, when Juno skims just 2,100 miles above Jupiter’s cloud tops while ripping by at 129,000 miles an hour (57.8 km/sec). The new photos show dozens and dozens of individual storms that take the shape whirling eddies and swirling vortices. Quite a few of them nearly the size of Earth. Think about something that big blowing by the neighborhood. Unlike the Earth, where weather’s powered by solar heating, Jupiter produces most of its heat through gravitational contraction. Yes, the planet’s still contracting from its formation 4.6 billion years ago, which keeps its core hot, about 43,000° F (23,000° C), four times the temperature of the sun’s surface. That heats works its way up into the atmosphere, where with the help of the planet’s rapid rotation, monster storms are born. Jupiter’s clouds are art, pure and simple. No one would even think of dreaming up what nature does naturally on this planet nearly half a billion miles from Earth. Let it inspire us.